Mr. Dressup Casey Finnegan: What Happened To Those Beloved Puppets? The two CBC stars live a very different life now. If you were one of the many Canadians who grew up watching the beloved CBC children's show "Mr. Dressup," you might wonder from time to time: why did Casey and Finnegan suddenly leave? The long-running show starred Mr. Dressup, as well as the mild-mannered host's beloved friends, a straw-haired genderless child named Casey and their silent gray dog Finnegan. Together, they went on many adventures. But towards the end of "Mr. Dressup," the two puppets mysteriously vanished. Their absence, starting in 1991, was explained to viewers as an academic leave -- the two were attending kindergarten. The show continued without them until 1996. 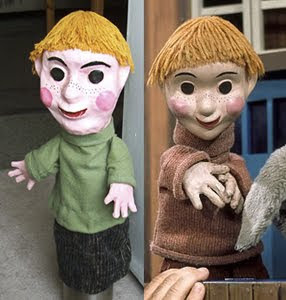 In reality, puppeteer Judith Lawrence, who made and moved the two puppets, had chosen to retire from the show. Lawrence told CBC she chose to leave because she felt that TV consumption was becoming too vapid and commercial. With her departure, Lawrence took the puppets she had made by hand. "Much to the CBC's chagrin," she said. "They thought they owned them." Nowadays, the perpetually four-year-old Casey and Finnegan live with Lawrence in her home on Hornby Island, a small island on the coast of British Columbia. While she's no longer an active performer, Lawrence still gets into character. In an interview with Hornby Radio in 2012, Lawrence spoke in character as Casey (who also translated for the non-verbal Finnegan). When asked what they've been up to on Hornby Island, Casey said the two have been bored, but that they like to spend their days gardening. "Sometimes we got out and see people, but sometimes we hang out in our puppet box," Casey said. Finnegan digs for fun, which Casey calls impressive for a "dog with no legs." In the radio interview, Casey said that they keep in touch with their friends from Mr. Dressup: "Alligator Al, he's still around ... he could be flat on one side." That is, apart from Aunt Bird. "She was made out of rubber, and it perished," Casey said. The iconic Mr. Dressup, played by the late Ernie Coombs, died in 2001. Reacting to the death of their dear friend, Casey answered with the honesty befitting a child. "Finnegan said that he's not here anymore, but he's in our hearts," Casey said. Casey and Finnegan will stay on Hornby Island, but not forever. Lawrence's will dictates that the two will be donated to CBC's museum following her death. The museum is where Casey's treehouse is, but Casey isn't keen on returning to it anytime soon. "I don't think puppets should be in museums because they look dead," the puppet declared, no doubt echoing how Lawrence feels. If a trip to visit Mr. Dressup's friends in B.C. isn't doable, you can make your own Casey and Finnegan puppets at home with this tutorial series.